Contact Bellotti Law Group, P.C. 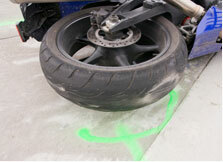 The experienced Boston motorcycle accident lawyers at Bellotti Law Group, P.C. implore all motorcyclists to abide by Massachusetts state laws, to minimize the risk of serious injury and/or death following a crash. It is important to remember that motorcycles share the same rights and responsibilities as any other vehicle on the road. When another driver's negligence causes an accident, our attorneys hold the at-fault driver accountable. Contact us today at 617-225-2100 for a free consultation to discuss your options. In short, pursuant to M.G.L. c. 90 § 7, all riders and passengers must wear a safety helmet. Massachusetts is in the vast majority of U.S. states with helmet laws. In fact, 19 states and Washington D.C. require, like Massachusetts, all motorcyclists to wear helmets when riding. An additional 28 states require at least some motorcyclists, depending on certain factors, namely age, to wear a helmet. Finally, only three states, Illinois, Iowa, and New Hampshire, have no helmet laws. In Massachusetts, you must have at least the minimum amount of insurance by law to register a motorcycle at the Registry of Motor Vehicles. Standard policies and insurance minimums require Bodily Injury protection (BI) of at least $20,000 per person and $40,000 per accident, Personal Injury Protection (PIP) coverage up to $8,000 to cover medical expenses and lost employment, and at least $5,000 per accident to cover property damage. Further, each motorcyclist's policy must have at least $20,000 per person and $40,000 per accident uninsured motorist coverage. Again, these are the minimal requirement, by law. Your registration will not be approved until this minimum insurance is purchased. Often times, we seen negligent motorcyclists weaving in and out of traffic, sharing the lane with other cars and trucks. This action is not only unsafe and significantly raises the risk for serious injuries and deaths, but is prohibited under Massachusetts law. Motorcyclists and motor vehicle operators must learn to safely share the road, not share single traffic lanes. More often than not, serious motorcycle accidents resulting in broken bones, paralysis, closed head injuries, and death involve another car or truck. Lane splitting significantly increases this risk. There are many other legal requirements before riding a motorcycle in Massachusetts. For example, helmet speakers are prohibited, eye protection is required for permit holders (unless a windscreen is in use), left and right turn signals must be equipped, and handlebars cannot rise above the rider's shoulders when seated in a safe position. Our Boston motorcycle accident attorneys suggest all riders become familiar with, and routinely practice, all safety laws before getting on your bike. Contact our Boston motorcycle accident lawyers at Bellotti Law Group, P.C. today at 617-225-2100 if you or a loved one has been injured or killed because of another driver's carelessness. We have offices in Boston, Cambridge, and Quincy and serve all of Massachusetts. We serve clients throughout Massachusetts including, but not limited to, those in the following localities: Suffolk County including Boston, Brighton, Charlestown, Chelsea, Mattapan, Revere, and Roslindale; Middlesex County including Belmont, Cambridge, Concord, Lowell, Malden, Medford, Newton, Somerville, Waltham, Winchester, and Woburn; and Norfolk County including Braintree, Brookline, Cohasset, Dedham, Needham, Quincy, Stoughton, Wellesley, and Weymouth. Copyright © 2019, Bellotti Law Group, P.C.